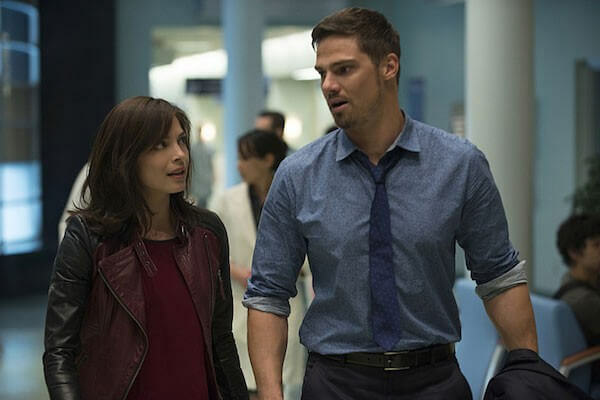 The CW’s Beauty and the Beast returns for a third season on June 11, 2015 at 8pm ET/PT with an episode titled “The Beast of Wall Street.” The relationship between Cat (Kristin Kreuk) and Vincent (Jay Ryan) has gotten stronger and this season finds more people in on Vincent’s big secret. Episode one of season three was directed by Jeff Renfroe from a script by Brad Kern. VINCENT HAS WEDDING BELLS IN MIND — With the happy couple seeming to be enjoying an ordinary life, Vincent (Jay Ryan) thinks the timing might finally be right to pop the question until Cat (Kristin Kreuk) stumbles on an extraordinary case with the FBI involving somebody who goes on a superhuman rampage. Though reluctant to engage with the case for fear of losing the normality he has found, Vincent finds himself with no other options when Cat is injured after discovering that someone is drugging innocent victims and transforming them into super-humans. Meanwhile, Tess (Nina Lisandrello) accuses JT (Austin Basis) of stalling his recovery as he tries to understand how he’s still alive. Nicole Gale Anderson also stars. Next Article Starz is Bringing ‘Outlander’ and ‘Ash vs Evil Dead’ to Comic Con!